Llangattock Mill Cottage01873 840348work Self-cateringSet in the beautiful Monmouthshire countryside, on the Welsh border, near Abergavenny. Sleeping between 2 and 4 and set over three floors, the Mill was formerly an 18th century working corn mill - now fully modernised. Ground floor: containing a fully fitted kitchen with washing machine, electric cooker, fridge freezer, microwave & dishwasher. First floor, the main room, opens out to a patio area with an 8 metre heated (May - September) swimming pool and stone built barbeque area. TV and audio system. On the second floor is one double bedroom, a single room with bunk beds and a fully fitted bathroom, with corner bath and shower. 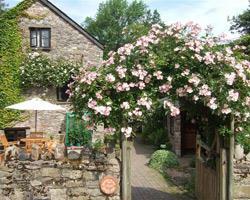 Set in the beautiful Monmouthshire countryside, on the Welsh border, near Abergavenny. Attractions/activities within 6 mile radius: Sugar Loaf Mountain, 4 golf courses, 5 castles, a Steam Railway, Mining Museum, Monmouthshire & Brecon Canal and the famous Abergavenny Food Festival which takes place annually in September. Free WiFi Children welcome from age 12. Abergavenny bus & train station - 3 miles. From the north: follow the Old Raglan road to Penpergwm. From the south: exit at Raglan, take the B4598 to Penpergwm.